Angel wings are an extremely popular tattoo design. They can be worn anywhere on the body, including the shoulder blades and back. This style of tattoo can have a number of different meanings, including memorials, protection or just a desire to show off your more angelic side. Angel wing tattoos typically appear as back pieces, lower back tattoos and smaller designs that can be placed anywhere on the body. They may be colored or black and grey, and they can be inked in any tattoo style. The type of wings you choose depends on the reason for your tattoo. It's a personal choice. In general, the bigger the wings, the bigger the statement. Some people choose to have wings that cover the entire back. Others choose smaller wings that adorn the shoulder blades or decorate just the center of the upper back. If a full back piece doesn't appeal, consider getting a pair of smaller, shoulder wings. These wings move from the shoulder blades out to either side of the back. The position of these wings is what gives them their "angel" attribute. They can be realistic, with detailed feathers, or more abstract with bold, black lines to indicate wings, without actually displaying them. People have chosen Celtic-influenced designs, tribal patterns, free-form flames and butterfly-style wings. The wing shape can also be formed from multiple smaller shapes. Color is another option. The same feathered wings could look solemn in black and grey, but wild and joyful in color. Lower back tattoos are often abstract designs, but they can incorporate virtually any image. Angel wing tats can be adapted to make beautiful lower back designs. If you choose a lower back tat, you'll want to make sure that the wings are incorporated into a design and not simply sprouting from the sides of your spine. A central image such as a heart, a Celtic knot, a sunburst or a star can pull the design together. Remember that wings positioned on the lower back can't stretch vertically the way they can from the shoulder blades. Keep this in mind as you design your wings and any image that will be centered between them. In many cases, this simply means rotating the design inward, but may also mean stylizing the connection of wings to body. The wings don't have to sprout from your body; they can be symbolic, surrounding and protecting something else. One popular design is the initials of a lost loved one, surrounded by protective wings. The wings can also represent the belief that the person who has died is now among the angels. Other designs may include a heart surrounded by wings, or anything you hold dear and wish to be protected. Influence: It can be easier to see a pair of angel wings on your front than on your back, particularly if you are looking in a mirror. Tattoo a pair of wings in this spot if you need a regular reminder of angelic influence or power in your life. Keep in mind that when leaving the most natural place for a pair of angel wings - the back - that abstract designs can lose some of their power. It can be difficult to convey angel wings done in a wild style if they are not located in the usual place. Angel wings can be incorporated into tattoos on arms, shoulders, calves or anywhere else on the body. Choose another area than the back if you want to be able to see your wings on a regular basis. Wings placed on the wrist or hand, for example, may serve as a reminder to you of an angelic presence in your life. The early biblical angels weren't described as having wings. In fact, they resembled ordinary men, although they brought extraordinary messages. Over the years, however, artists have drawn and painted angels and other holy creatures with pure white, feathered wings, and present-day images of angels almost always include wings. Angel wings have found their way into novels, movies and comic books. The X-Men stories feature a winged young man who joins the band of heroes. Many other fictional and legendary characters, both good and evil, sport angel wings. 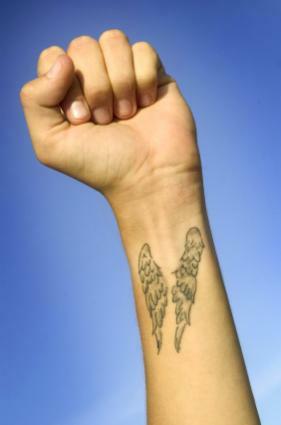 If the idea of angel wings is exciting or intriguing to you, consider getting a pair as a tattoo. Angel wing tattoos can be a beautiful expression, no matter where on the body they are placed, or how they are rendered. Show off your angelic side by displaying your own set of wings.